The robots are coming, and they're bringing dinner. 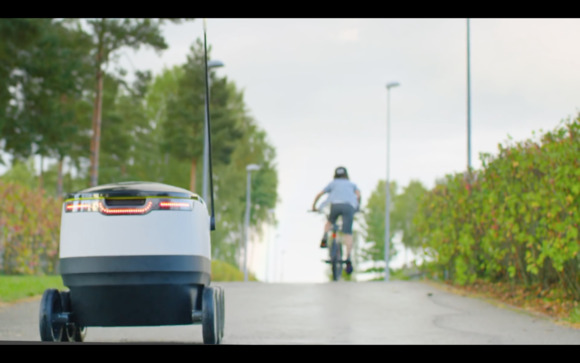 Food delivery company Just Eat will begin testing a mostly self-driving robot from Starship Technologies this month, using it to carry orders to customers within a few kilometers of participating restaurants in the U.K. Despite the high-flying name, Starship Technologies has a down-to-earth ambition: Automating local logistics over the "last mile" between retailer and customer, for a cost of around £1 per delivery. It plans to do that with a six-wheeled robot that looks like a cross between a Roomba and an icebox. The robot trundles along at a brisk walking pace, monitoring its environment using an array of cameras. Most of the time, it chooses its own route, avoiding obstacles and people. It's not entirely autonomous: A human operator stands by ready to aid the robots they are monitoring by remote control, for example to help one cross a road or avoid a previously unencountered obstacle, according to the company. The robot's cargo hold is locked in transit, but customers can unlock it using a mobile phone when it reaches its destination. Starship Technologies has been testing the robots around its office in Greenwich, London, since March, and is now ready to scale up its tests. Although the business headquarters is in London, the engineering team is in Estonia, the country where Skype was founded. That's no coincidence: Skype co-founder Ahti Heinla is the company’s CEO and CTO. Food delivery startups Just Eat and Pronto.co.uk, German parcel delivery company Hermes, and German retailer Metro will soon be using dozens of Starship Technologies robots to make deliveries over distances of almost five kilometers (about three miles) in the U.K., Germany and Switzerland. The robots travel at about 6.5 kilometers per hour, and will take up to 30 minutes to make deliveries, according to the company, although those figures don't quite jibe with the maximum range. At that pace, customers had better hope that the cargo hold is as well insulated as a cooler, else their hot food may arrive cold.